Seems to work his way through the gaps pretty well for a big dude. His only other offers are three of the worst Southland schools? Do we congratulate ourselves for being able to put recruit only average FCS schools or do we try to hide that fact? Yes! Awesome! Another instance of out recruiting the bottom of the Southland! At this rate, with the babysitter’s club we have moonlighting as a coaching staff, we should be able to finish in the middle of the Southland! thank god you quoted the post! never would have guessed what on earth you were referencing! whew! 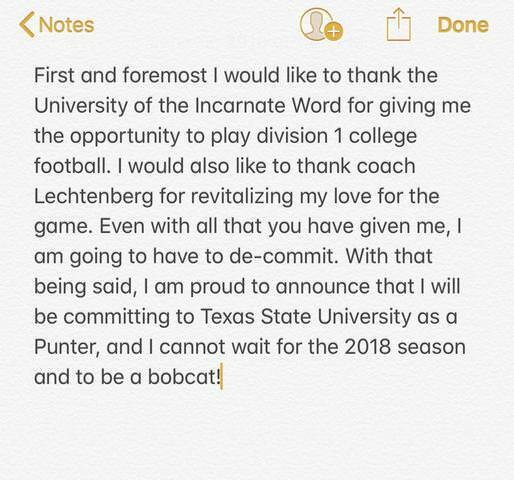 Punter reported he had a PWO offer at UIW. He'll be a PWO at TXST I'm sure. Looks like a 2018 kid also. Boy, do we stick out like a sore thumb. You’re trying too hard. You’re not good at this. my hatred of worthless quoting predates your presence by years. in terms of trying, you should try harder to at least post better technically, since your content obviously isn't going to change at all. There are numerous prospects and commits being discussed in this thread. Readers would have no idea which one I was talking about unless they went through each prospect’s offer list, hence, it’s common sense to quote which one I was referring to. By message board protocol, I am doing it the correct way. Again, you’re trying too hard. wrong. when replying to the post directly above yours, there is not only no need to quote that post, it's a violation of message board protocol to do so, as you are simply eating up the screen w/ a repeating message. you aren't on reddit. wrong. when replying to the post directly above yours, there is not only no need to quote that post, it's a violation of message board protocol to do so, as you are simply eating up the screen w/ a repeating message. you aren't on reddit - there is no ambiguity as to which post you are replying to. try harder. That makes no sense. If somebody is typing a post which takes a few minutes, by the time they hit "submit," there could be numerous other posts that are made before their post is finished. In that case, your theory of "replying to the post directly above yours" doesn't work and leads to plenty of ambiguity and confusion. See why it is not only appropriate to quote the post you are responding to but also is wise to do? Probably not, because that would take some intelligence to understand. Next, you're trying to discuss message board protocol while just having posted the same thing twice in a row with the second post only having added a sentence or two? Are you too dumb to use the edit feature, moron? You're failing miserably at this, but it seems clear by this point that you've grown accustomed to failing.